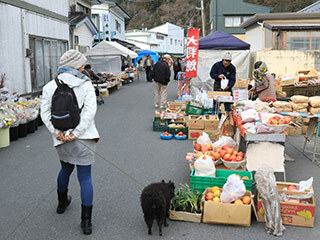 Sakarimachi Morning Market (盛町朝市) is held at the date of the number of 0 and 5 at Sakarimachi, Ofunato, Iwate prefecture. It is over 100 years old morning markte that many people bring their local food and all hand mades. They has great local vegetables, fruits and fishes. There are about 50 different stores. You can enjoy great local products here. 1. use Dragon rail Ofunato Line to Sakari. Sakarimachi has the morning market that has the history of over 100 years old. There are about 50 different shops open every dates of the number of 0 and 5. You can enjoy great local fresh vegetables, fruits, snacks, fishes and many other foods. They have also clothing, flowers and other glossaries.